This 25-mile National Recreation Trail forms a perfect weekend loop moving from easily accessible front country to some very remote corners of the George Washington National Forest. The loop begins along the headwaters of the North River, but quickly climbs to the ridges and stays there, which means water is scarce. “A lot of the trail follows ridgelines that provide some very panoramic vistas,” says Dennis Herr, who organizes fun ultra runs on the Wild Oak Trail. Begin your 7-mile day at the parking area near North River Gap (the low point along the trail) and start your counter-clockwise hike by climbing Grindstone Mountain and Chestnut Ridge. Prepare for the views along the ridge leading to Little Bald Knob, the highpoint of the trail at mile 7. Look for small, flat clearings near Little Bald Knob to pitch your tent for the night. Take a walk out the gated FS 427 for excellent views from the ridgeline. Save enough water for the 8.5 mile hike, including the three-mile, 2,000-foot drop to the North River. The next climb to Big Bald Knob is steep and rocky, but this perch has arguably the best views along the trail. You’ll hike along the border of the Ramsey’s Draft Wilderness before taking a hard left to descend Dividing Ridge. Look for campsites along the trail before you reach FS 96. At 10.2 miles, the last day is your longest. Climb up Hankey Mountain to the gated forest road for several miles. Then the trail gets technical again, with the last few miles highlighted by steep, rocky climbs leading to dramatic overlooks before dropping back down to the parking area. The Iron Mountain Trail can seem a bit disjointed at times: a 19-mile stretch between Cross Mountain and Damascus that ends with a road walk into town, then another 14-mile section near the Little Dry Run Wilderness. But the best section parallels the Appalachian Trail inside the Mount Rogers National Recreation Area running for 23 miles between Damascus and Highway 16. Pick up the trail just outside of downtown Damascus and begin a rocky climb up to Feathercamp Ridge. Camp at the Sandy Flats Shelter for the night. It’s a short 6.2-mile day, but this will give you time to take an optional side trip down Feathercamp Trail, which drops into a cover offering a series of wading pools and small cascades. Continue heading east on the Iron Mountain as it crosses a forest road and rolls and dips over small knobs along the Iron Mountain ridgeline. Eventually, you’ll start passing some older growth trees and pass the Straight Branch Trail shelter, 4.5 miles into your day. Keep on trekking another four miles to the Cherry Tree shelter. There’s some road walking as you skirt the edge of Round Top and Double Top. The Iron Mountain Trail, which shares the path with the Virginia Highlands Horse Trail for less than two miles. You’ll cross paths with the A.T., then drop and rise in and out of seasonal creek gorges. Between the A.T. and the intersection of 4022, locals know of a pasture with incredible views called Comers Meadow. It’s off trail, but if you’re looking for adventure, it’s worth seeking out. The big finale of this portion of the Iron Mountain is Comers Falls. Take the Comers Creek Trail 0.2 miles to a series of drops and pools inside a tight, rocky gorge. The North Fork Mountain Trail offers stunning views of the Shenandoah Valley. Photo by Michael McCumber. The North Fork Mountain Trail is a 24-mile long ridgeline trail running along the entire crest of the North Fork Mountain near the Virginia-West Virginia border. 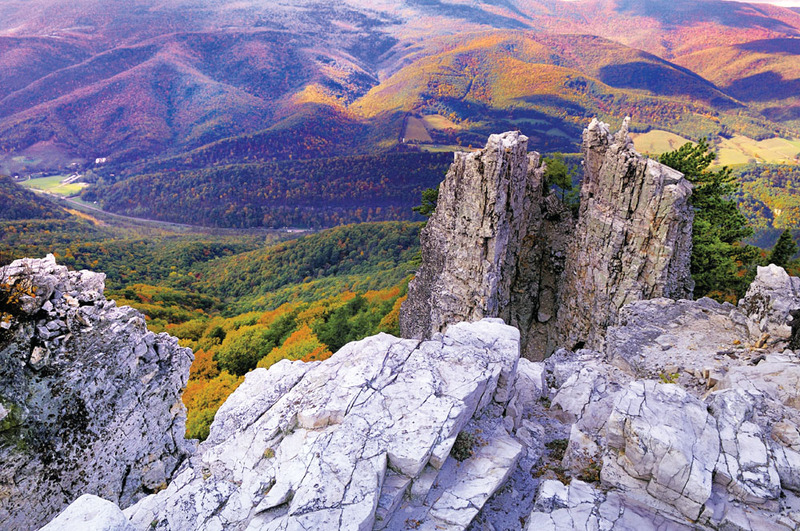 Along the way you’ll get incredibly dramatic views of Shenandoah Mountain, Seneca Rocks, two forks of the Potomac, and Dolly Sods. The mountain has long been highlighted by the Nature Conservancy for its surprising biodiversity. The rocky crest supports ancient, twisted oaks, white pines, beds of ferns, even virgin red spruce. The trail is the centerpiece of a recent effort to create a federally designated Wilderness area. Start at the southern terminus and roll along the ridgeline, where you’ll get your first big view of Germany Valley and Spruce Knob to the west. 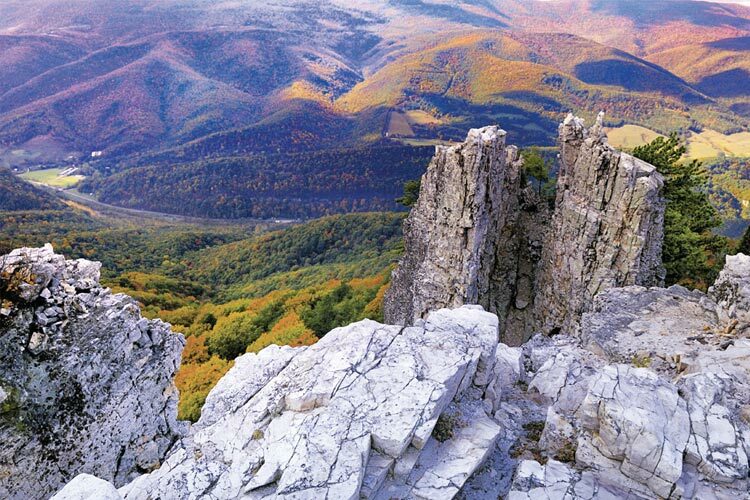 Eventually you’ll reach High Knob, which has campsites and a view of Seneca Rocks. If you’re fit, push forward and turn this into a two-day, one-night trip, where you stash a car with water and food at FS 79, halfway into the trail. There are campsites within a short walk of either side of the road. Continue hiking north and enjoy the views of Dolly Sods and the South Branch of the Potomac. The trail arrives at Chimney Top Rocks, a massive sandstone cliff band with arguably the best views along the trail. Shortly after the cliffs, you’ve got an 1,800 foot descent over 2.5 miles to Route 28, near Smoke Hole Caverns. The Laurel Highlands Trail meanders through some of Pennsylvania’s most scenic river valleys. Photo by Michelle Adams. The 70-mile Laurel Highlands Hiking trail serves as the backbone of a 218-square-mile forested area that ’s called the Laurel Highlands. The area has 600 miles of hiking trail. 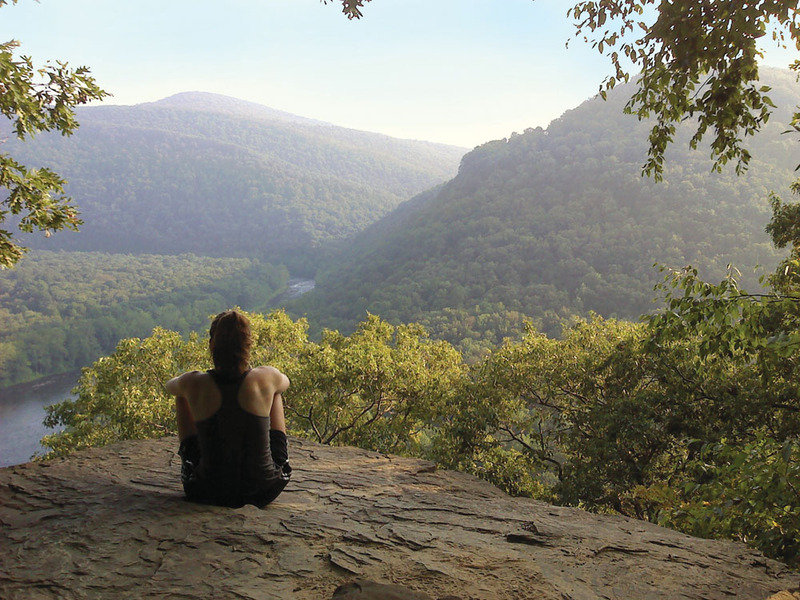 The Laurel Highlands Trail runs from Ohiopyle State Park and the Youghiogheny River to the Conemaugh River, connecting a variety of maintained forests along the way. 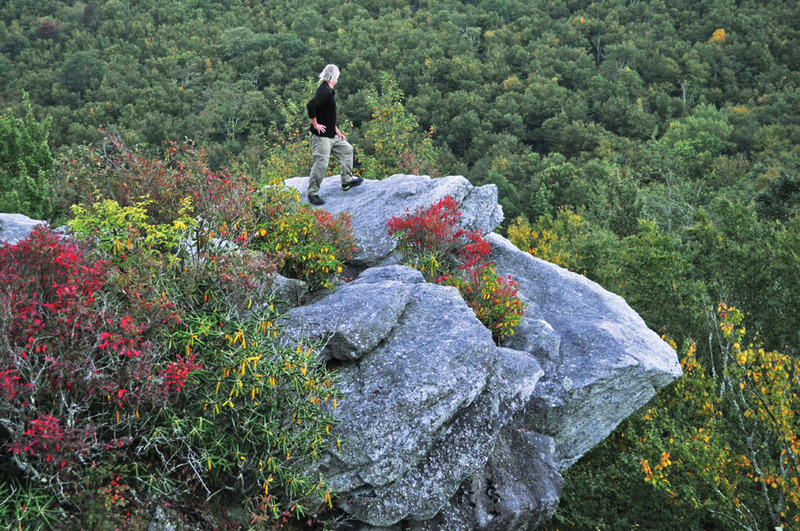 “You hike from park to park, running along the ridge, occasionally dropping into stream valleys, and popping back up for great views from cliffs,” says Bruce Sundquist, who wrote a guide to the Laurel Highlands Hiking Trail for the Sierra Club. The trail is blazed at regular intervals, has concrete mile markers, and offers shelter systems with reliable water, making this the most beginner-friendly long trail in the region. Note: the hiker’s bridge over Interstate 76 has been removed and an 8-mile road walk detour is in place. Start at Ohiopyle State Park and hike along the river before climbing to the top of the ridge for views of a bend in the mighty Yough below. You’ll drop off the ridge into a stream valley, cross a forest road and arrive at the first trail shelter after six miles. Start your day with a two-mile climb to a level ridge at 2,500 feet. You’ll skirt a pond below Cranberry Glade Lake before mile 14, then pick up your next shelter at mile 18.5. Keep rolling along the ridge at 2,700 feet through a state park, then drop off Grindle Ridge, cross a few creeks, and arrive at next shelter at mile 24. Enjoy the scenery near Seven Springs Resort, as well as some brief lake-side hiking. After the eight-mile detour, continue hiking north to the highlight of the trip, Beam Rocks, offering sweeping views to the east. Your shelter for the night sits at mile marker 46.5. This 11-mile day rolls through Laurel Ridge State Park where you’ll spend the night at a shelter at mile 57. You’ve got 13 miles to the northern terminus through some of the most scenic terrain along the trail, especially as you skirt the rim of the Conemaugh Gorge. Views of the river below are almost continuous for the last few miles of this thru-hike. The 20-mile John Muir National Recreation Trail in Eastern Tennessee (lovingly referred to as “the other JMT”) follows a tiny piece of the 1,000-mile journey that John Muir took from Kentucky to Florida in 1867. The trail predominantly follows the Hiwassee River, except when it rises via switchbacks to ridgelines and cliff bands to offer gorgeous views of the broad, green canyon. “Trillium, jack in the pulpit, bloodroot, and other wildflowers line the trail in April and May,” says Harold Webb, a native to the area who owns the Webb Brothers General Store. Begin at the Childers Creek Parking area and start hiking upstream. The first three miles are flat and easy, passing through wildflower meadows. You’ll do a little road walking but also get up onto some high bluffs with great views of the river and its green gorge. The gorge gets thin at “the Narrows” and the trail rises to a serious cliff line high above water level. 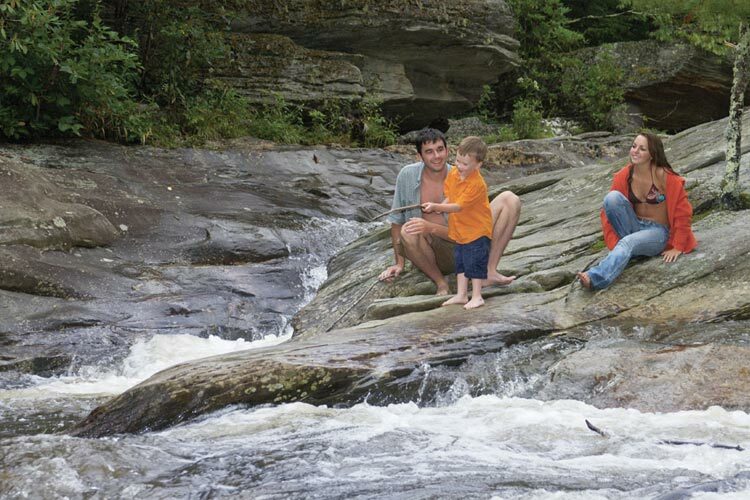 Find primitive campsites along Coker Creek. You have seven miles from Coker Creek to TN 68, most of which is hiked along the Hiwassee River. Optional Side trip: Before you break camp, hike 2.5 miles up the Coker Creek Falls Trail to the falls of the same name, which is a series of ledges and pools (the biggest drop is 40 feet). Before the hike is over, you’ll leave the river to climb a ridge to an overlook 600 feet above the riverbed that offers a view of the Hiwassee Gorge and beyond. The trail continues for a mile past TN 68, but it’s typically overgrown and strenuous. A hiker pauses at an outcropping along the Tanawha Trail near Grandfather Mountain, N.C. Photo by Todd Bush. 13.5 miles may not sound like a long trail, but the technical terrain and panoramic side trips make the Tanawha a mini-epic adventure. The Tanawha (Cherokee for eagle) parallels the Blue Ridge Parkway along the edge of Grandfather Mountain, running from Beacon Heights to Julian Price Park. “You’re either walking through rolling meadows or extremely rocky boulder fields,” says Jason Berry, a hiker who chooses the Tanawha for short overnight excursions. Sections of the Tanawha are so biologically diverse that massive boardwalks were helicoptered into place to keep our feet off of precious plants. Accessing the trail is easy, thanks to the Parkway. The tread is schizophrenic, oscilating between smooth singletrack to rocky steps to boulder hopping. Start this 9-mile day at Beacon Heights and head north. Pass under the Lynn Cove Viaduct (an engineering marvel that attracts visitors all on its own), and gets even more technical as you make your way up to Rough Ridge, an expansive rock outcropping with beautiful views. Along the ridge, you’ll climb rock stairs, squeeze through chutes, and climb boulders. ”It’s like a jungle gym for big people,” Berry says. After the ridge, the terrain mellows. Stop at the Hi-Balsam Shelter near Flat Rock, an amazing stargazing site. You’re roughly six miles from the northern end of the Tanawha. Optional Side Trip: The Cragway Trail offers views of the Boone Fork Bowl. After a mile, hang a left on the Nuwati for a short hike to Storyteller’s Rock for an even better view of a valley. Take the Nuwati downslope to its junction with the Tanawha in 1.2 miles, then continue your journey north. The terrain gets progressively easier as you near the terminus at Julian Price Lake, with meadows blanketed in spring wildflowers. Fires Creek Rim Trail, N.C.
Backpackers come to this 25-mile loop for one thing: solitude. The Rim Trail hugs the ridgeline around the 21,000-acre Fires Creek Wildlife Management Area, in a remote corner of the Nantahala National Forest. Blowdowns and briars also cover this rugged, remote trail, and water is scarce, so be prepared to work for your solitude. More Info: Appalachian Outfitters: 828-837-4165. Start at the trailhead at the Fires Creek Picnic Area soaking in the 25-foot Leatherwood Falls before heading northwest on the Rim Trail. Travel 8 miles on your 3,000-foot climb to Big Stamp. The Phillips Ridge Trail junction is one of the few reliable sources of water, so stock up for the journey ahead. Pack up camp and continue your trek along the Rim toward Tusquitee Bald, 7.3 miles away. You’ll cross Weatherman Bald, which sits just under 5,000 feet and offers partial views of the surrounding peaks, and the headwaters of Fires Creek. When you reach the edge of Tusquitee Bald, scramble up the Chunky Gal Trail a short distance to the grassy, 5,200-foot summit. The last nine miles are a predominantly downhill hike as you make your way back to the Fires Creek Picnic Area. Along the way, you’ll pass Potrock Bald, which many backpackers say is the best view along the trail. 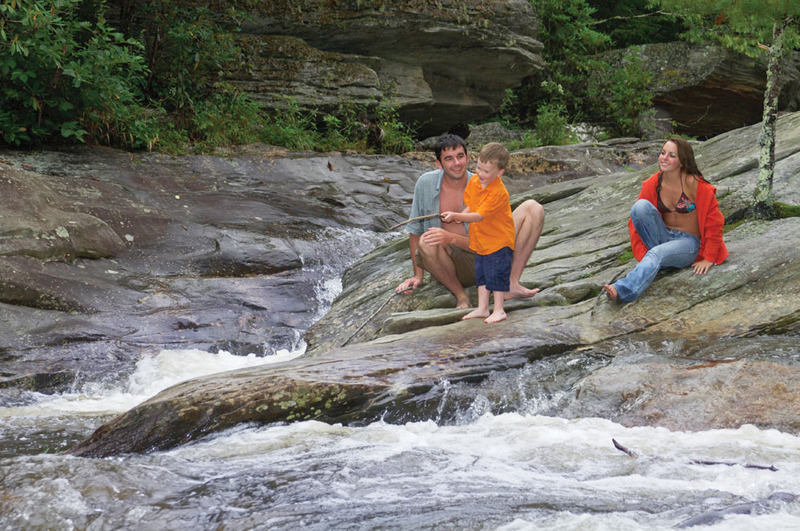 Side trips along the Tanawha Trail lead to swimming holes and cascades. Photo by Todd Bush. This 30-mile-long footpath traverses balds, rocky knobs, Wilderness areas, and the Blue Ridge Parkway. “If you take the A.T. and mash it up into 32 miles, you get the Art Loeb,” says Marcus Webb, a Brevard-based hiker and climber. With rhodo tunnels, waterfall sidetrips, 360-degree views, and ridgeline traverses, the Art Loeb is a highlight reel of the Southern Appalachians. There are even a few shelters stashed along its route. From Daniel Boone Camp, tackle the beastly 2,000-foot climb to Deep Gap in under four miles. Optional side trip: a three-mile out and back to the summit of 6,030-foot Cold Mountain. From Deep Gap, head south through the heart of Shining Rock Wilderness, traversing the Narrows, a mile-long ridgeline crest. Eventually you’ll pass Shining Rock, a massive collection of quartz rock. In 8.2 miles, reach Ivester Gap and set up camp for the night. From Ivestor Gap, keep heading south on the Loeb, crossing 6,000-foot Tennent Mountain and Black Balsam Knob, a rocky dome with 360-degree views. Cross over the Parkway and hike Shuck Ridge. You’ll reach another Deep Gap at 7.6 miles. Set up camp, or pick a spot in the shelter for the night. 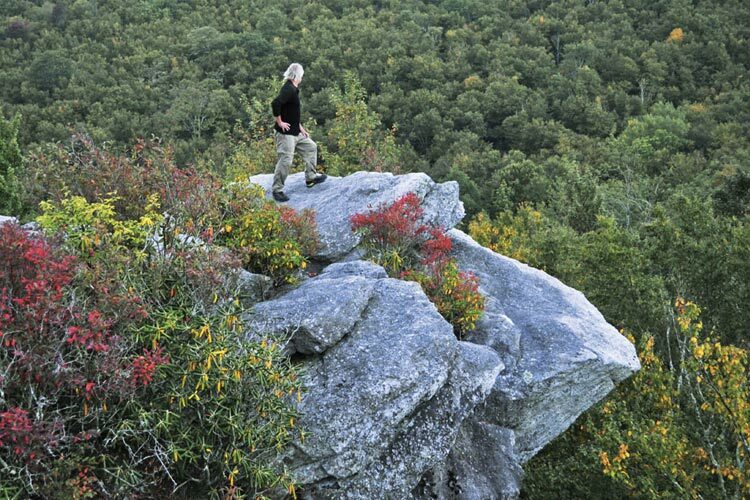 After leaving Deep Gap, you’ll summit Pilot Mountain, with great views of Looking Glass Rock. Butter Gap Shelter is only 6.1 miles down trail. If you’re looking for another side trip, check out Butter Gap Trail, which offers a dramatic waterfall just 1.5-miles from the Loeb. It’s 8.2 miles to the southern terminus at Davidson River Campground. Skirt Cedar Rock Mountain shortly after leaving the shelter, and at Cat Gap, consider a side trip to John Rock, a granite cliff that drops 200 feet. After the gap, it’s a steady drop and smooth sailing into the campground. SurvivaGuard Expeditionary Supply – Take it Along for More Energy, Increased Endurance and Greater Mental Sharpness.